I served at 8th & I from September 1952 through February 1954, following my service with the 7th Marines in Korea. I was one of a group of four returning veterans assigned to 8th & I following our service in Korea. At that time we had two platoons of Marines serving in the Ceremonial Guard Company. The first platoon was the Drill Team and the Second Platoon consisted of Marines who served at many various details. One of the major details at that time was the Body Bearer team. A Corporal served as the Body Bearer Team leader. Since we were serving during the period when the Korean War was still being fought, there would be days when we spend the entire day serving on burial details. A hot lunch was brought to us by truck from the 8th & I galley. The teams of Body Bearers rotated. Some days we would have two teams serving at Arlington. The members of the Firing Squad also rotated. We all were members of the same platoon. Members of the First Platoon (Drill Team) also were responsible for burial details along with many other ceremonial details. I have the impression that the current policy at 8th & I is to have a specialized team or teams of Body Bearers, and their primary (and perhaps only function) is to serve as body bearers. That certainly was not the case back in the early fifties. Back in those days, we served in many capacities - some quite glamorous. 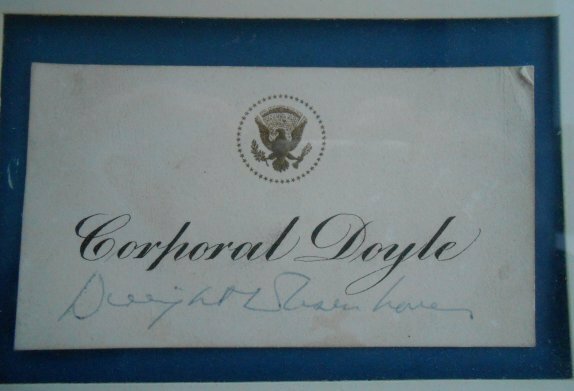 I had the fortune of being selected to represent the Marine Corps at a luncheon hosted by President Dwight Eisenhower at the White House on November 10, 1953. It was the official opening of USO Pal Week. The president entertained representatives from four branches of the Armed Forces, along with some Hollywood and industrial luminaries. Individual Marines also were invited to dine with Senator's wives and families at the Senate dining room. I was selected to do so on two different occasions. I recall a group of Marines of Irish ancestry being invited to the Irish Embassy for a birthday party for the Ambassador's son. A couple of my Irish buddies attended and came back with some great stories - like the ambassador's son helping the Marines steal the ambassador's liquor and sneaking it out the embassy back door and hiding it in the 8th & I station wagon. We essentially were “Ceremonial Marines”, and we would serve at many different functions where the presence of uniformed Marines was desired or required. Frankly, it was pretty good duty! Sometime during my tour at 8th & I we formed an additional platoon of Ceremonial Marines, the Third Platoon. This was a substantial help in lightening the load for members of both the first and second platoons. After General Eisenhower was elected President in 1952, he and his wife, Mamie, enjoyed spending weekends at Camp David. This required an entire platoon to serve as guards at Camp David. This resulted in many consecutive weekends of duty and deprived us of weekend liberty. A platoon was required to remain at 8th & I for the weekend and the other platoon would have to serve as guards at Camp David. You can bet this resulted in one hell of a lot of angry Marines! The addition of the third platoon was a great relief. Incidentally, Camp David originally was called “Shangri La”, named by President Franklin Delano Roosevelt. President Eisenhower changed the name to Camp David, in honor of his grandson, David. I hope this background information will be of help to you. I am curious as to why you need this information. Are you in the process of writing a history of Body Bearer duty at 8th and I? Semper Fi, and as you younger Marines now say, “OOH RAH”. (Or something that sounds like that). I like the 'gravely' in your email requesting Body Bearer info. I have no written information or articles about Body Bearers but I was in on the inception of the first full time Body Bearers that began in the late 1950s era. In our days at the Barracks, there were four platoons in Ceremonial Guard Company plus the Color Guard. Each platoon performed its own 24 man silent drill routine. This was peacetime and there were not multiple funeral details as in other times. Body Bearing details (and I cannot recall the means or method of a rotation, although Denny Harris being Co. Clerk might remember) were not as smoothly performed as of course would happen with a dedicated unit. Also rifle salutes could be ragged. I don't know who ordered that there be a full time unit formed but when it was I was put on it as the lead NCO. I was 3rd squad leader and drill supernumerary in 2nd Platoon as an E-3 Corporal in early '59 (as I remember - and before the additional snuff grade of LCPL was added). Transition was happening and when I got wind of a full time Body Bearers unit to be formed I applied. I got the job and reported as NCOIC to SSGT Glenn S Tait who was the Color SGT. We were attached to the Color Guard and when the company made the move to Bldg 58 at the Naval Gun Factory we were assigned to an old office on the M Street end of the building, sharing it with the Color Guard. AND.. it was air conditioned! No ventilation were we happy. SSGT Tait was great to work for. He was not interested in managing but just wanted results. We called our own shots as far as practice went and worked hard to shine as a top unit within the company. We did well in this regard and got accolades from Captain Hatch and Gunnery SGT Faylor. Members were not selected as much as assigned from other platoons. No longer being part of a Camp David rotation and being so small we were able to rotate 72 hour passes, which were very rare, and that was a big draw. These were allowed by Company command for continually doing well at inspections. We seldom buried anyone who was not retired or a dependent. The largest funeral was for Secretary of State John Foster Dulles. I don't know why but CPL Ross Downing (not in BB) was selected to do the job for the joint military affair, done with full honors. I wondered at the time why I was not asked but ultimately was happy about it. I realize that today strength is a factor in selection, and I cannot ever remember bench pressing anything. Ross, also a former 2nd Plt member, had been a high school football star in Coral Gables, FL and had attended U of Florida for a year on a football scholarship as a wide receiver and was much stronger than I. He said that the Secy Mr Dulles was laid in state in his home in Georgetown (I think it was) and Downing with the combined unit went to pick it up there to take it outdoors to the caisson (I think). There were french doors that did not open wide enough for six men, so being at the head and at the right corner he had most of the weight. He said the casket weighed a ton and if it were not for the hand hold in the corner he would have dropped it for sure. We spent most of our time during the day polishing our gear and needed little practice. We polished our brass and shined shoes and barracks cap bills and chin straps. Leather was brown but like everyone else we dyed it black and shined with black Kiwi - keeping a can of brown polish handy for when someone on high complained that our gear was too black. We were also responsible for the Measured Post, both at the Barracks main gate and for Company details at the Iwo Memorial where we had a double MP. One last tale. One day and I remember it being cold on the back side of Arlington we had a dependent's funeral. There were only a few family members attending and it was on a side hill. We set the casket down and when it was time to depart there was a snag. We all stepped back off the planks, but as we did Ron Wentzler's foot was stuck, wedged under the horizontal pole that the casket was on. All members had the presence of mind to freeze and not to make the normal facing movement away from the head of the casket. Then the 'bereaving' family began to laugh, and the Chaplain chimed in. Ronnie had stepped down fairly far because of the side hill and it was really comical with him grabbing his ankle and pulling to dislodge himself. He got himself loose and we made our facing movements and got down the hill to the bus - all with straight faces and without a sound - till we got out of earshot and then all hell broke loose. I hope that these memories might add to your gatherings, Norman. I would be happy to 'talk' more if you wish. I should add that I did not keep the NCOIC job. SGT Lyman G Thibodeaux was assigned to us and being senior was put in charge. This was before we made the move to Bldg 58 at the Naval Gun Factory in DC. I would like to add a postscript to Dave's well written recollection---I too had finished my tour at the Barracks as a member of the original BB unit. What is probably not too well known, is that in May of 1959, several of us in the 3rd Platoon were assigned to Ft. Myer for three weeks in preparation of the pending death of John F. Dulles. We were to be part of the detail at the National Cathedral once the Sec'y's casket was to be on display for public viewing. At Ft. Myer we got to see the several soldiers of The Old Guard practicing what we now see at the Barracks, the Rifle Inspection routine at the conclusion of the Silent Drill Platoon's routine. This routine was brought back to the Barracks, under Cpl.McCarthy (or was he a sergeant then) and that summer incorporated into the drill. 2-16-13 ... John, Enjoy reading the recollections of other Marines that were there in the 1950's very much, but would like to make one correction for historical purposes. In 1957 - 58 things were a lot less formal and nothing was compartmentalized as it is today. When CGC received a funeral detail from the post operations officer, the Company Commander and the First Sergeant put their heads together and considered what was going on in the Company, who was doing what, who had the lightest work load as of late and made a decision as to which platoon would be assigned to a particular funeral detail (remember, only three platoons were available as one platoon was always at Camp David for a two week stint). Once a decision was made, the platoon commander was notified and at that point, the platoon sergeant alerted his platoon and things started happening. The platoon sergeant with input from his platoon guides would simply start pointing fingers...you, you and you will be in the firing party, you, you and you will be body bearers, etc. etc., and it worked! Over time everybody was involved in all aspects of the funeral. From what I saw, it was a good method... a mission was assigned to a platoon and it was entirely up to the platoon to get job done! I suppose the thought was when some one does the same thing over and over, day in and day out, they become better at it, hence a separate unit of body bearers, a separate unit of drill team members, etc, etc. That all makes sense of course, but for one, I thoroughly loved the diversity....two weeks of "down time" at Camp David away from the hustle and bustle of DC, performing every four weeks at the evening parade, strutting at the main gate on guard duty, arrivals at Andrews, being a body bearer at Arlington or being in the firing party or on light days being assigned to a working party listening to old Sergeant Sterling down in the basement tell war stories. It made for a pleasant, sometimes hectic, tour of duty and I can honestly say one that I will never forget and I think this is the reason we have such a successful 8th and I association...a bunch of guys holding on to a great bunch of very pleasant memories! 2-16-13 ... Hey John...Just read Don Keelan's memory of the rifle inspection. If he was talking or remembering the rifle inspection as "the inspector stopping in front of one of his preselected troops, exchanging rifles during a series of throws over under and around with this preselected Marine" then his memory is lacking. We did not get this inspection from the "Army". 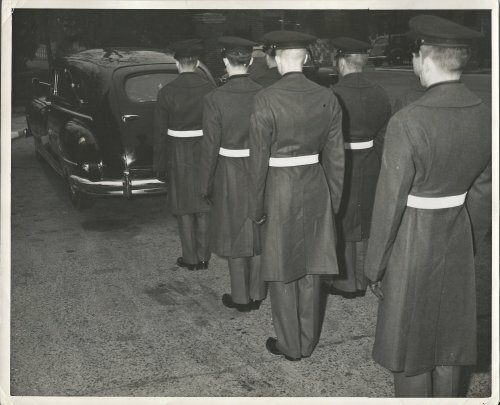 In 1957, Sgt Juneau started this inspection in the Second Platoon drill team which has been a mainstay ever since. Also in 1957 we did not have a section of "body bearers" per se...when a select group of Marines were chosen to work a detail at Arlington Cemetery 6 were told they were to carry the coffin...we were all schooled in the procedure of carrying the coffin and folding the flag...we were also schooled in how to conduct the proper final volley (with blanks) I took part in this ritual numerous times. Fred is right on target! Sgt Juneau and Cpl Thompson with the second platoon practiced this for hours on end and finally performed it at a friday evening parade in the summer of 1957. Cpl Thompson lived about two miles from me in Valley Station, Kentucky and I had never met him until I arrived at 8th and I. I personally thought Corporal Thompson was one of the sharpest Marines at 8th and I. By the way, if anyone knows anything about about Cpl Thompson, please let me know. Ben Juneau and I have been trying to find him...no luck thus far. If anyone can even remember his first name that would certainly help. Cpl Thompson and I spent many hours traveling to Kentucky (leaving after the evening parade, driving all night and arriving the next morning in Ky and leaving late sunday and again, driving all night and arriving in DC just in time for morning formation) ....then down to Guys that night, how did we do it....the staying power of young Marines..WOW! NOTE: We honor Norman "Mustang" Hatch on our website's Hall Of Valor (Iwo Jima and Tarawa), http://8thandi.com/valor.html . 2-18-13 ... John, I guess it is time for an old timer to check in on the funeral details of 1939. There were no platoons between the Barracks Department or MCI, except for parades. When special details, such as funerals, were required, the men were selected by their individual commands as those that could be spared from regular duty of the day. There was no need for special details as all Marines were expected to do what was asked of them. Of course for new arrivals to the barracks there was initial training of the specialties the Barracks troops were expected to know thus making all of the men equally trained. Now three comedic things I was involved in that were not funny. One day, after several snowy days, I was participating in a funeral and we were all advised by the senior officer present that we were to be especially careful as our burial location was on a hill side. The family and Marine Officers were standing at the top of the rise when we started down. All went well for one third of the movement when one of the lead men, carrying the coffin, slipped and went down. This of course changed the weight proportions for each man, who was struggling to keep upright, then we all went down releasing the casket that merrily slid on its own stopping at the open grave site. The family was crying, the officers were trying to placate them and we were once again, coffin in hand, standing at the grave site. That was a day! A second occasion happened after some old timers, and there were plenty of them at the Barracks, advised several of us that it was smart, when in a firing party, to use blank cartridges, so if you fired late or early it would not be heard and thus you would not be severely admonished. However one day, unknowingly, all four of us fired blanks. The meeting with the Sgt. Major can not be printed and we were on work details for two months. The third happening was to me only. In those days we used a lot of White Ace shoe polish to keep our white belts and caps in outstanding appearance. I was standing at attention outside of the Old Chapel when it started to rain. The white polish running down my face and on to my shoulders as well as more running from the belts down my trousers made my blues a sight to see. I had another conversation with the Sgt. Major which ended that practice. Hope this brings a laugh or two from the troops. 2-19-13 ... From: Drum Major Gene Belschner, Ret. I received your e-mail about Body Bearers at the Bks so I thought I would tell you about who were the Body Bearers from 1947 till approx 1952 or 53. I reported for duty with the Drum and Bugle Corps in August 1947. I was surprised to learn that our job was not only to be a D& B but also we were the Body Bearers for the Bks and Arlington Cemetery. 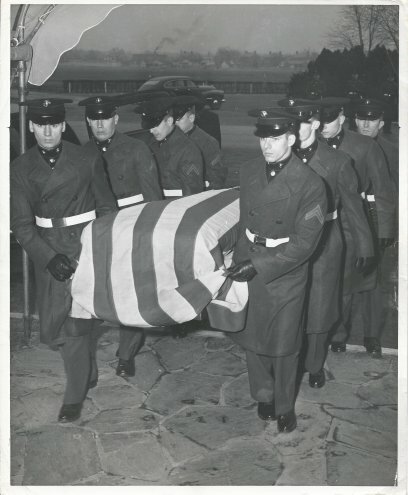 When I left the Bks in late 1951 to go to Korea the D&B were still acting as Body Bearers. When I returned in 1956, the D&B was no longer the Body Bearers, the Bks Detachment Marines had taken over the job. This was before Building 58 at the Naval Gun Factory in DC. 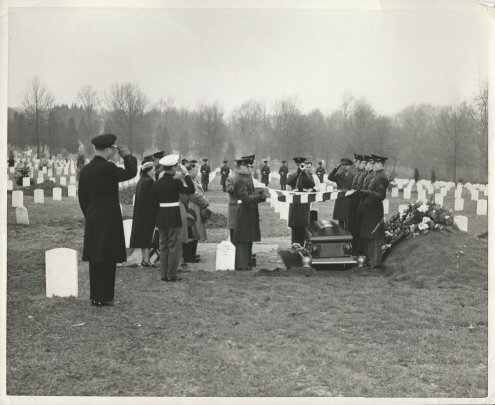 After World War II they started bringing back the war dead from the Pacific and Europe for re-burial in Arlington Cemetery. The picture is from the newspaper in 1947. They called these funerals “mass burial”. The picture is of the first mass burial held in October 1947, they had 4 men on each casket holding the flag through 3 different religious services. As you can see it was all different services present. 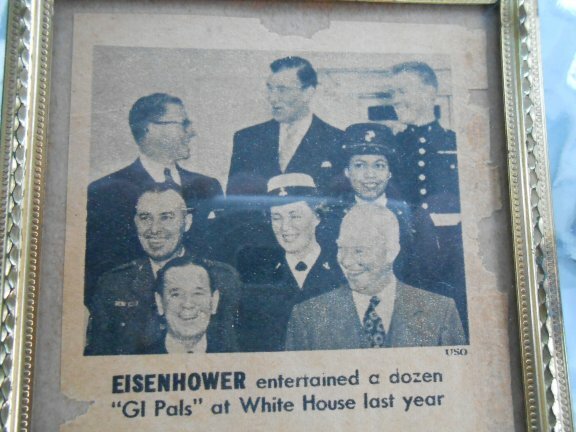 President Truman was there as many other dignitaries. 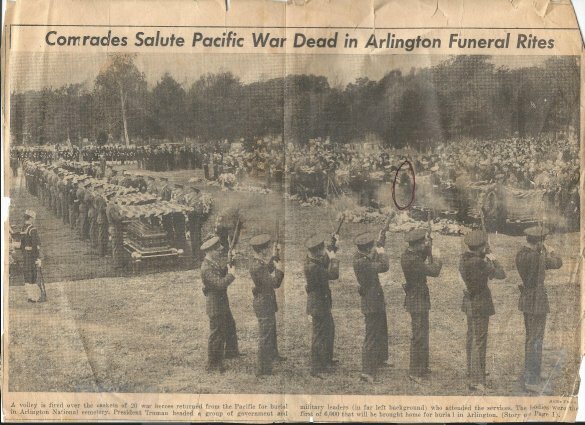 I am the Marine circled on the second casket on the right. After the first mass burial we had a mass burial once a week or so for the next year. At that time we buried only Marines and the rest of the Services buried their own. In 1948 I also had the honor to be the Cpl. In charge of the Body Bearer re- burying Gysgt. John Basilone who was brought back from Iwo Jima. I am sending some pictures of me as a hash mark Cpl E-3 in charge of the 8 man team. I am the Marine on the left at the foot of the casket in all three pictures. Also, take notice of the blue covers on our barracks caps. I hope this shines some light on the history of Marine Bks Body Bearers.